The 4th dimension is created with our detailed Photo Chrome skin print and strike provoking scent! The details are incredible and so lifelike it will be even harder for the predator fish to resist a full committed attack! Each lures color design has been tested and tuned to perfection and the added DNA scent level will give you the extra edge, when conditions are though! The 4D Line Thru Perch is designed with a larger Line thru channel, so it is possible to change the trace easily. It comes pre-rigged with the Carbon49 wire trace, mounted with the Line modifier clip. 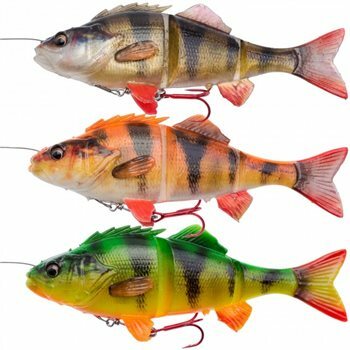 The 4D Perch has enhanced details and a gat slot for scent pasta or a trout pellet! The perfect, realistic S-curve swimming action combined with the with the immaculate Photo chrome skin print and Scent, will make an incredible lure even more effective! The line thru channel through the nose gives the lure a swimming action very close to a Real Perch and on those days where the perch is on the Pike and Musky Menu this lure will catch a monster!